Until now, Project 333 has been all about dressing with less, but with a new challenge I revealed yesterday, Project 333 is coming to a kitchen near you. Streamlining my wardrobe and dressing with 33 items or less every 3 months has come with so many benefits. When thinking about other places I struggle with moderation and identifying “enough”, food comes to mind, and according to the first question in this survey, many of you can relate. 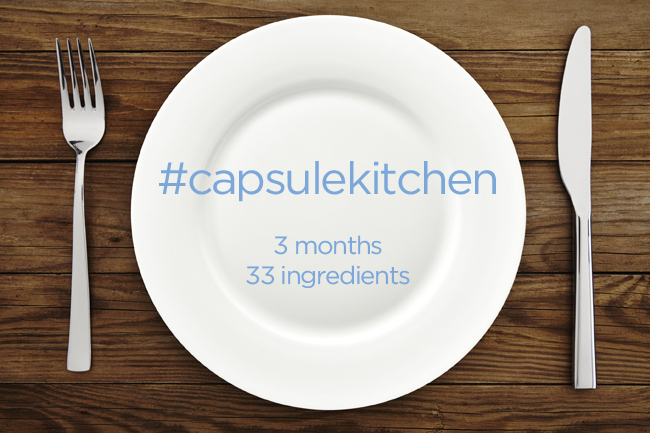 If you want to eat healthier without giving all of your time and attention to counting calories or meal planning, try the Project 333 Capsule Kitchen Challenge: 3 months 33 ingredients. Click here for the rules and more details. The purpose of Project 333, in the closet or the kitchen, is not to live with nothing or to sacrifice style or taste, but instead to discover what matters most.